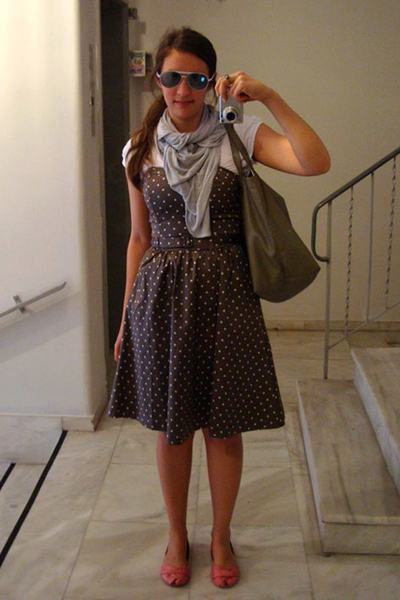 Polka-dot dress, H&M. White t-shirt, ZARA. Grey skinny scarf, H&M, Pink shoes, Blowfish. White-rimmed aviators, Von Zipper. What I wore yesterday to the 7ply Project opening night at Technopolis. Sadly, my camera died shortly afterwards, so I don't have any more pictures. However, the skateboards exhibition will be open all weekend, so if you're interested in street culture, skate and graffiti, drop by and check out the 80 skateboards created by famous Greek and foreign artists (some of them made by very close friends of mine). See you there! Lopi 8imasai pou elega pos apokalipto ta podia moy xoris kaltson meta to telos ton eksetaseon? Nomizo pos fetos 8a spaso tin paradosi kai 8a s akolou8iso!Zestainei epikindina o kairos! teleio to louk me ta roz papoutsakia! polu wraio outfit lopi, bravo! ta sunduases ola polu wraia. Perfect! 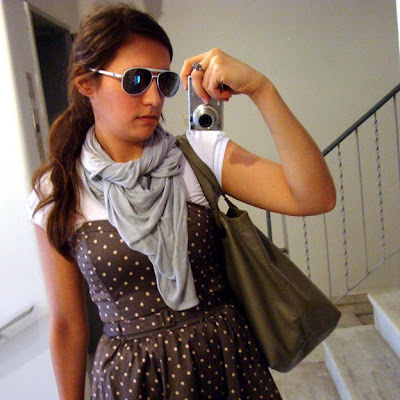 I love the dress (polka dots look so classy on you) and I really like the fact that you did not pair the outfit with equally girly sunglasses (but you chose those unisex VZs)! Hey there!!! Nice try!!! Keep up the good work!!! Elena: Ha, I didn't actually "choose" those sunglasses... Actually, they're the only ones I've got at the moment! I really have to find some nice, oversized ones, soon. K@terina B: Το layering με το μπλουζάκι δεν το είχα ξαναδοκιμάσει ποτέ και απλά προέκυψε γιατί ήθελα να βάλω το συγκεκριμένο φόρεμα εκείνο το βράδυ χωρίς να κρυώνω. Πέτυχε το πείραμα υποθέτω! Και το φουλάρι πάντα ψιλοτυχαία το φοράω, αλλά στην συγκεκριμένη περίπτωση πρέπει να πω ότι έχω δέσει κόμπο τις άκρες μαζί. Βοηθάει στο να μην γλιστράει από τον λαιμό. Και πιστεύω αν έβαες θα ήσουνα τέλεια με το ταλέντο που έχεις στα κόμιξ. Τώρα που το ανέφερες, πρέπει να δοκιμάσεις! John L: Thanks, but I don't see it as effort or hard work. I just get dressed! exeis skeftei ektos apo to blogging kai tin arxitektoniki na asxolitheis me personal shopping kai styling? ?